You know you are a true biryani lover when your answer to ‘what is your favourite food?’ is ‘biryani, duh!’ When the only reason you attend shaadis is because there is a chance that biryani might be served. You make it a point to let everyone around you know about this beautiful relationship that you have with biryani. So if they ever think about inviting you over, they know what you’ll want on the menu. But you know what they say, with great love comes great responsibility and so you consider this your responsibility to distinguish between good and bad biryani. Which means you don’t just accept any ordinary chaawal as biryani. You want the BEST one. So anything sub-par will be labeled ‘plain old chaawal’ as the title of ‘biryani’ is reserved for that perfect recipe alone because your inner Gordon Ramsay will not rest until justice for biryani is restored. Don’t worry, we are not judging you in any way because we are exactly like you. Always on the hunt for ‘the one’. So today we will introduce you to this place that makes the perfect biryani.’ It is so good that no matter how hard you try to stay away from it, you won’t be able to resist. This place is none other than Karachi Biryani Hearts! As soon as the steaming hot plate of biryani comes, your head will turn. The beautiful saffron colored rice cooked in an authentic blend of spices with tender chicken pieces will definitely tantalize and tingle your taste buds in the best possible way. The aromatic goodness of all the different herbs and spices will become your greatest obsession. A cool raita and some salad added on the side will spike up the flavours even more. Prices that will make you go wow! The prices are also unbelievable! You can get the regular portion for one hundred and fifty rupees and the large portion for two hundred rupees. The quantity of these is quite hefty so you can share a plate with your friend as well. So all you biryani enthusiasts, what is the hold up? 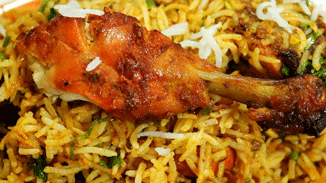 Get yourself the best biryani in town. You don’t even have to leave your house. No need to stress out in traffic or wait in long queues for that perfect plate of biryani. Just leave everything to Cheetay. Hurry up and visit Cheetay’s website or download the app and order away.